Keeping pests of your garden is one major attribute in showing how we love our garden. We invested money, time, effort and hard work in making our gardens beautiful and our plants healthy. We definitely do not want to see anybody or anything for that matter trampling over our beloved plants. If somebody makes that mistake, their ears would be ringing for days. Yet, what if it’s your beloved pets that trampled over your newly planted garden? What if you see your cat using your vegetable bed as a litter box or your dog digging its ways over your mulch? You would be mad of course, but there’s nothing you can do the un-do that damage. You can always repair it, but your garden will always be at the risk of a disaster created by your beloved four-legged friends. So, keeping pests of your garden will surely be beneficial both to you and your plants. Of course you can’t blame your pets from ruining your garden. After all they are animals. You should know better. You can’t keep them inside your house either, because it’s either your living room or garden that they will be tearing at. Keeping them outside is the much better option. Yet how can you prevent in keeping pests of your garden and from peeing on your crops or scratching out your plants? One way is to train your pets. Dogs are easy to train. You can do so by doing operant conditioning which operates on a punishment and reward principle. You can punish your pet every time they destroy your garden so that they will learn to avoid doing it because they know it will lead them to be punished. However this method on keeping pests of your garden may take quite awhile and more destroyed crops later. Not to mention that punishing your pets could be one ground that PETA will come knocking in on your door charging you for animal cruelty. Instead of doing something about your pets, you can go to the other end of the line and do something to safeguard your plants. Here are some tips on how you can protect your garden from your pets. • There are beliefs that moth balls, oils or black pepper can ward off animals from your plants. These are actually harmful and poisoning to your animals. However, you can simply spray your plants will plant sprays that are designed to keep your animals away. Commercially-prepared sprays like these have a pungent odor and tastes just as bad. So, the next time your pets try to bite your plants, they will learn their lesson because for certain they would not want to taste anything that bad again. Just be sure that the spray you purchased is safe to use around your pets or else they may get sick from it. Ask your vet if it is safe to be used against your pest just to be sure. 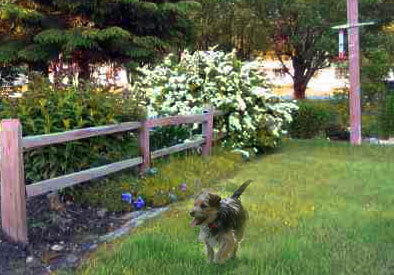 • Another way to keeping pests of your garden is to build a fence around it. However, this is not a picket fence, but rather a different kind of enclosure. What you can do is to place stakes that are at least 5 feet high at each corner of your pant garden. Place chicken wire around the garden, just make sure to make a simple door for you to enter the enclosure in case you need to fertilize and remove weeds. On the top, you can place a screen or net to keep birds from attacking your plants. • There are also high-end equipments that can scare away your animals to leave your plants alone. There are tools available in the market that squirts out a strong blast of water to keep your pets and other troublesome animals away from your plants. These kinds of equipments have built-in sensors that detect any movement up to 30 feet away that sets the water to go off like a squirt gun for about 5 seconds. • Before even planting anything on your garden, that is, during the planning phase, it is best to consider how your plants be protected from animals and pests. It is recommended that the plants be planted in an elevated plant bed because it makes it harder for animals to reach them. You plants are always under threat, either from your pets, the environment and the weather conditions. These threats should be considered early on when your garden as not been built yet. So, keeping pests of your garden is a must for a typical gardener.